According to tweets by La Mirada Football, UCLA head coach Jim Mora and assistant coaches Eric Yarber and Taylor Mazzone are coming to La Mirada High School tomorrow to see prospects. Stanford assistant coach Mike Sanford and Ohio State assistant coach Tim Hinton are also coming to La Mirada tomorrow. 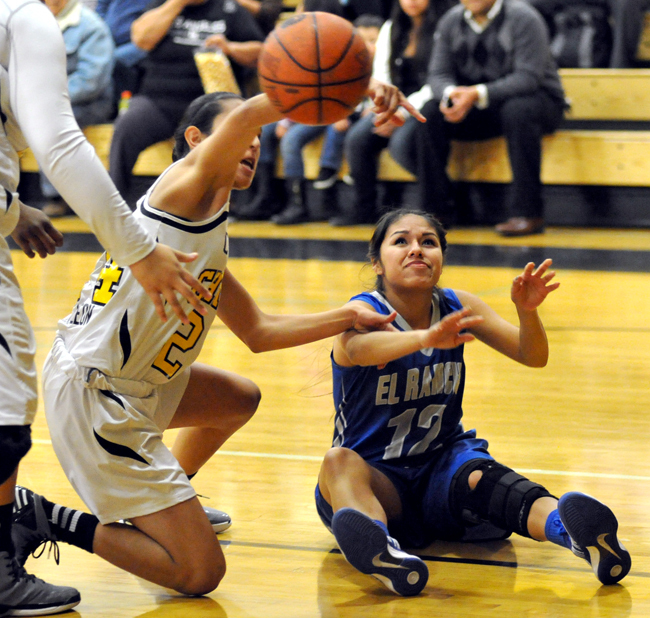 SANTA FE SPRINGS – Santa Fe High School put together a dramatic fourth-quarter comeback for a 53-50 victory over El Rancho in a Del Rio League girls basketball thriller on Wednesday. After visiting El Rancho took a 47-39 lead on Khadidja Diakite’s 3-pointer, the Chiefs scored 14 consecutive points. Back-to-back 3-pointers by Vivian Lara and Destiny Cardona started Santa Fe’s game-winning surge. Marisa DeLeon tied the game at 47-47 with a jumper and followed with a key defensive rebound. That set the stage for Lara, who put the Chiefs ahead with consecutive layups. Jasmine Ramos finished the Chiefs’ rally by making a pair of free throws. El Rancho’s Sarah Gurrola closed the scoring by making a 3-pointert with 0.6 seconds remaining in regulation. The Dons drew no closer, however. Santa Fe kept its hopes for a league crown alive. In handing the Dons their first league loss the Chiefs (13-10 overall, 5-2 league) moved to within one game behind first-place El Rancho (20-4, 6-1). Lara led the Chiefs with 19 points while DeLeon and Ramos added 13 and 10 points, respectively. WHITTIER – California High School captured the Del Rio League wrestling title in dominating fashion by defeating La Serna 59-9 at home on Tuesday. The Condors capped off a 5-0 league record by winning 12 of the dual meet’s 14 bouts. Five of those victories came by fall, which were delivered by Chris Garcia, Elias Mercado, Adrian Chavez, Isaiah Escobedo and Mario Ponce. California coach Doug Loo said the Condors’ achievement was a result of an overall team effort. “I’m proud of the kids and the coaches,” Loo said. “They worked hard and put in a lot of time and effort. Tuesday’s triumph marked the Condors’ first league crown since the program was restarted 12 years ago. La Serna finished with a 3-2 league mark. Nate Espinoza, Escobedo and Mercado serve as the Condors’ team captains. “It feels great,” Espinoza said of winning the league crown. “We worked really hard for this. “It feels good to finally have that banner,” Mercado said. WHITTIER – With sole possession of the Del Rio League’s first-place spot at stake on Monday, El Rancho High School’s boys soccer team showed why it was ranked No. 1 in the latest CIF-Southern Section Division 3 poll. Senior forward Cristian Roldan scored two goals to help lift El Rancho to a 4-0 victory over host California. Jaime Moreno and Miguel Vilchis also scored for the Dons (18-1-1 overall, 5-0-1 league), who strengthened their hold on first place in the league standings. “Our kids played well,” El Rancho coach Dominic Picon said. “It’s nice to have a full squad back. It was the first time we played with our main people back since Christmas. Cristian Roldan did a great job stretching their defense. California, which played El Rancho to a 2-2 tie earlier this month, fell to 6-4-3 and 3-1-2. With the regular season winding down, the Condors hope to finish strong. The St. Paul High School girls basketball team is off to a strong start in the Camino Real League. The Swordsmen (12-11 overall, 4-1 league), who are ranked No. 1 in the latest CIF-Southern Section Division 4A poll, are coming off a 39-24 victory Thursday over Cantwell Sacred Heart. St. Paul, however, will face a major test today when it visits St. Monica (18-5, 4-1) at 7 p.m. The winner takes over sole possession of first place in the league standings. It’s the season’s second meeting between the schools. The Swordsmen won the first one against the Mariners, 53-43, on Jan. 10. St. Monica is ranked No. 3 in Division 4A. Priscilla Hidalgo scored 17 points to lead the Swordsmen on Thursday. Cassidy Carillo, Clarissa Hernandez and Adriana Gonzalez each had six points for St. Paul. Cantwell Sacred Heart (14-7, 3-2), ranked No. 5 in Division 4A, also remains in contention for the Camino Real League girls basketball title. After falling to St. Paul on Thursday, Cantwell sits one game behind the Swordsmen and St. Monica with three league games remaining in the regular season. The Cardinals will seek to regroup today at home at 7 p.m. against Mary Star of the Sea. Cantwell then will visit St. Monica on Feb. 5 before closing its regular season Feb. 7 against St. Joseph.